New Posh manager Graham Wesley was in good voice at Bradford City. Photo: Joe Dent/theposh.com. New Peterborough United manager Grahan Westley dedicated his debut victory at Bradford City today (September 26) to his assistant manager Grant McCann. 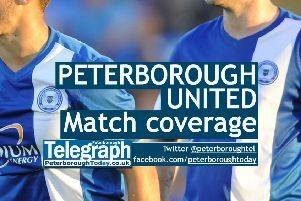 Posh delivered a superb away display to win 2-0 thanks to two goals in three second-half minutes from Lee Angol and Chris Forrester. Posh striker Lee Angol celebrates the crucial first goal at Bradford City. Photo: Joe Dent/theposh.com. It was a second successive League One away win for Posh who have now picked up seven points from their last three matches. It was the perfect result for Westley whose appointment earlier in the week wasn’t universally well-received by Posh fans. Not that Westley wanted to take any credit for the performance. “Give those three points to Grant McCann,” Westley announced. “I’ve worked with many coaches and I can say that Grant is exceptional. I’ve been hugley impressed by his work this week and this win was down to him as much as anyone else. “I was very pleased with the performance. We have some technically gifted players in the this squad and we have to play the passing game that suits them. “We also have some outstanding young players at the club. Ricardo Santos for one and he was outstanding today. “I don’t want to single anyone out though. This was a very strong team performance. They’ve all bought into what we want them to do and they played good football, but also worked really hard. “Look at someone like Marcus Maddison. He worked as hard off the ball as he did with it. The goals were scored were excellent, but we also saw the game out pretty well. “I’d rather we had kept the ball better, but we lost it on occasion because we had the desire to get forward and score more goals. The desre the whole club has - and I’m not just talking about the players - to be successful has been a real eye opener for me. Westley’s first home match as manager takes place on Tuesday (September 29) when Bury are the visitors to the ABAX Stadium. Today’s win lifted Posh up four places to 18th in League One.